Greetings! 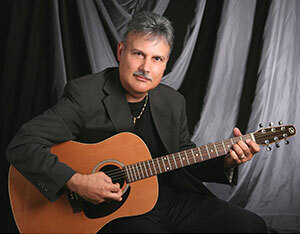 My name is Rick Iacoboni, and I have played guitar since age 8 and began teaching guitar over 25 years ago. As a performer I have played over 2,000 engagements both as a member of a six-piece horn band and as an instrumental acoustic guitarist. Teaching has been equally important and even more gratifying. I get great satisfaction knowing that I have made a difference in people's lives as I see their skill levels and confidence increase dramatically because of my teaching and their dedication. It's a partnership. I only accept students who are serious about learning guitar and are willing to commit to at least 15-30 minutes of daily practice. It has to be a priority. My students range from children (ages 8 + up) to adults to senior citizens. I even taught my son guitar starting age 13. He's now 25 years old and is an accomplished guitarist and studio musician. I am flexible in my teaching style. If a student wants a more formal approach, I can teach them how to properly read music and play guitar. If formal is not their thing and they just want to strum the chords and riffs of their favorite songs, or learn to improvise, we can go there also. Whether a student is brand new to playing or just wants to brush up on the basics, they have found the right place. My motto is: "Let's have some fun!" Taking that approach helps my students and I look forward to their weekly lessons. I aim to please! Am I too old to start learning the guitar? There's no age limit in learning the guitar. Anyone can learn to play the guitar, at any age, period. In many instances, adult students have less distractions and more time to devote to learning guitar. Making the time to practice is the single most important factor in whether you or anyone at any age will be successful in learning guitar. Guitar playing is not about age. It's about passion, creativity and just having fun! If you practice 15 minutes a week, it could take at least a year to learn the basics. However, if you practice 15 minutes daily, you will notice improvement within a couple of weeks. Daily practice is more effective than an hour of practice on a Saturday. Some students find that practicing at the same time every day -- i.e. after school, work or dinner; or just before going to bed – is the way to develop a consistent routine. Sore fingertips are very common for beginners or for those who haven't play guitar for a long period of time. The more you play, the faster calluses will build up on your fingers. Soreness is natural and nothing to worry about. Over time soreness will go away. If it becomes an issue, take a short break and come back to it later. Do I need to cut my fingernails? The fingernails on the fretting hand (the hand placed on the guitar) have to be short. 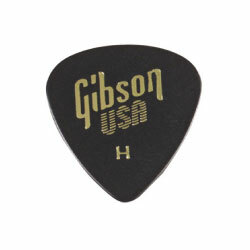 For the hand used to strum the strings, you have two options: use a guitar pick or finger-pick. In both cases you can have longer nails. Should I Play Guitar Left-Handed or Right-Handed? Only you can answer that question. It's whatever feels more natural to you. An easy way to figure it out is to stop what you are doing RIGHT NOW and play some air guitar for a few seconds. Don't think about it – just do it! 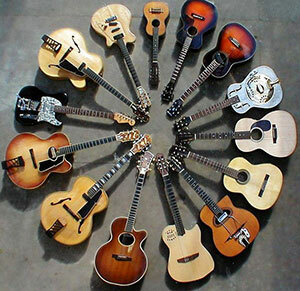 Which hand did you use to strum? If it was your left hand, you should play left-handed, and vice-versus with your right hand. Regardless on what people say, there is no advantage of playing left- or right-handed. Obviously, being a right-handed world, guitar dealers will stock mostly right-handed guitars. 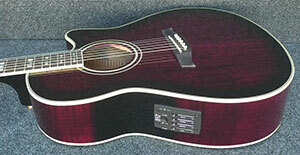 However, they can easily order left-handed guitars, or you can order them yourself online. Don't let a little inconvenience determine which way to play the guitar. Let nature take its course. FYI: I am left-handed and play guitar right-handed. What do I look for when buying a guitar? • If you want to play rock: buy an electric (which will need an amplifier to be heard). • If you want to play classical: buy a nylon string classical guitar. • If you want to play a variety of music – i.e. pop, folk, country, R&B, Top 40, etc. -- buy a steel string acoustic. • Small-sized guitars are for young children: 3/4 size, 1/2 size, 1/4 size. What are the differences between "classical" and "acoustic" guitars? • Classical guitars are smaller than modern acoustic guitars. • Classical guitars use nylon strings. Acoustic guitars use steel strings. • Classical guitar necks are wider than the necks of acoustic guitars. • Classical guitars have softer, mellower tones versus acoustic guitars, which have louder, more resonant tones. Are "electric guitars" easier to play? • The strings are thinner. • The strings are closer to the neck and therefore are easier to press down. • The neck is thinner on an electric guitar versus a classical guitar. What is an "electric-acoustic guitar"? 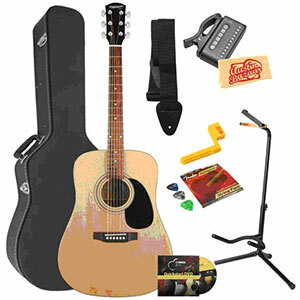 An electric acoustic guitar is an acoustic guitar fitted with a pickup and a preamp. The pickups are not like the pickups used on an electric guitar. These are like little microphones that catch the sound of the acoustic guitar and send it to an amplifier. You can play an electric acoustic guitar without plugging it into the amp and it sounds just like any other acoustic guitar. Picks come in various degrees of thickness. Buy a couple thin, medium and heavy gauged picks and try them out at home. 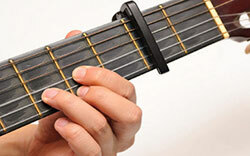 Thin picks will help you learn to strum chords. Medium or heavy picks are better for playing individual notes (scales, improvisation). Keeping your guitar in tune is critical, not only for playing solo but to play with other musicians. 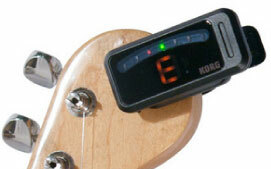 Go to your local music store and find the tuner that meets your needs and budget. Eventually you should learn to tune a guitar by ear in the event that a tuner is broken or unavailable. A capo, placed at the top of the guitar neck, is used to change the key of a song. If you sing, a capo can help you find the right key for your singing voice. 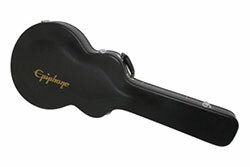 •	Hardshell guitar cases are heavier and offer better protection to the guitar. •	Gig bags are lighter and, thanks to straps, can be worn over the shoulder. Choose one with thicker padding. 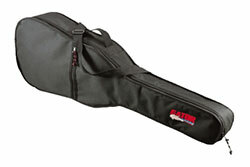 •	Cost: Hardshell guitar cases are more expensive than gig bags. or nothing falls on it. -- be careful not to bump into things. you may be better off with a hardshell case. •	Guitar strap and strap locks. •	Extra set of strings. •	Metronome (to help keep you in time). •	Three-ring binder with plastic, transparent sheets (to stay organized). To sign up to receive my Newsletter, send an email to: acousticalguitar@aol.com and include your full name, email address, phone number and city of residence.